Paul and I have lived in Riverside for just under five years and in that time we’ve seen a dismaying number of old downtown buildings be emptied or torn down … the Fox Theater has been restored to grand effect, true, but it can often seem that Riverside’s historic buildings are losing out. So, when we saw barricades go up signaling the demolition of a derelict downtown block, we were heartened by banners declaring that the site would become Riverside City College’s Culinary School and Center for the Arts, and not just some parking structure or something. Then came a surprise: Demo over, one of the smaller buildings had not been torn down at all, and, it had in fact transformed from a banal ’60s S&L, into a baroque green concrete cube! 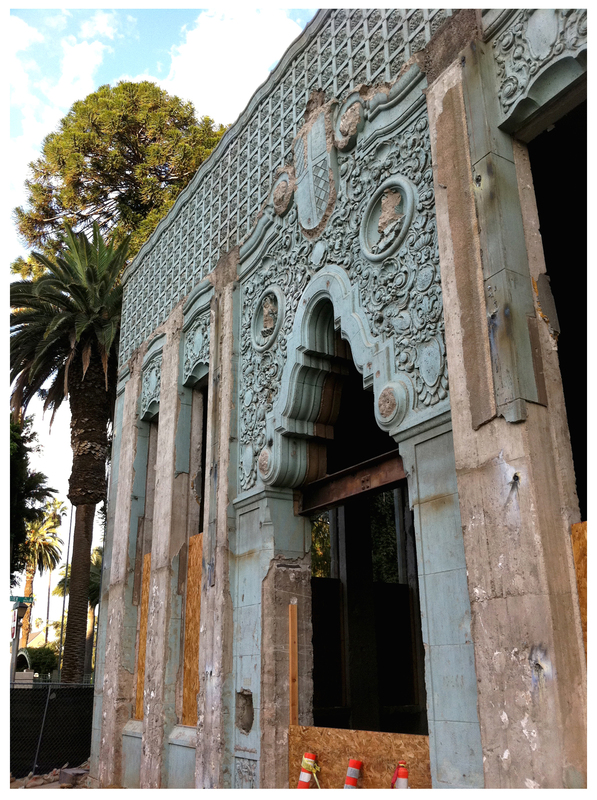 Reminiscent of Spanish architect, José Churriguera, it had the ornate look that epitomizes his work … The building was not designed by Churriguera, however, but rather in his style, by Los Angeles architect Stiles Clements (1883-1966) in 1926. If it seems oddly familiar, it’s because he also designed Los Angeles’ Wiltern Theater, as well as the El Capitan. Another surprise? This amazing structure will be incorporated into the new center’s scheme, becoming the Center For Social Justice & Civil Liberties, as well as providing gallery and archival space. Although a bit worse for wear after having been hidden behind a nondescript curtain wall for decades, it’s still a beautiful, and important, part of Riverside’s architectural history. Early morning walking has its advantages; slipping through construction fencing to photograph a building is the latest. I had to see what was going on close-up and inside the space. Inside, more surprises in the form of a gently arcing ceiling, dirt floor and windowless walls. Not being completely foolhardy I chose not to go into the space, but even from the outside it’s pretty stately. 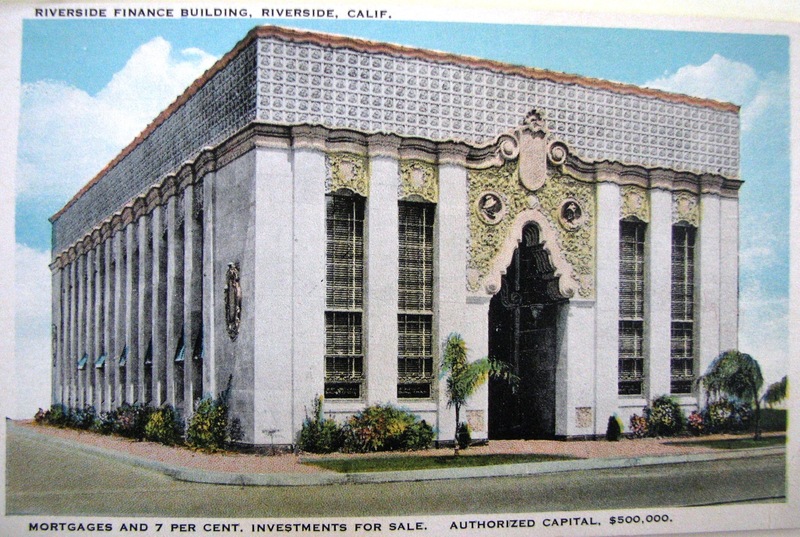 At one time known as the Citrus Belt Savings & Loan, it still possesses the presence of a grand financial building. This hand-painted vintage postcard depicting the bank in its heyday shows the building in a different color scheme from the odd green it is today. It also shows details that were sheared away to accommodate the structure needed to support the curtain wall that surrounded it for so long. 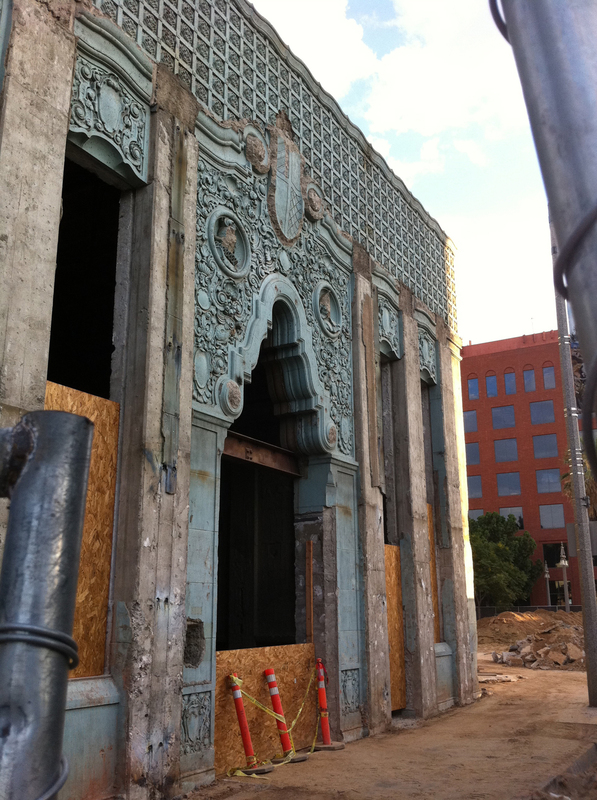 It makes me rather sad to see bits chipped away from the concrete face of the building, but I’m glad for what remains. I look forward to seeing how this remarkable structure will be incorporated into the overall scheme of the future RCC center. 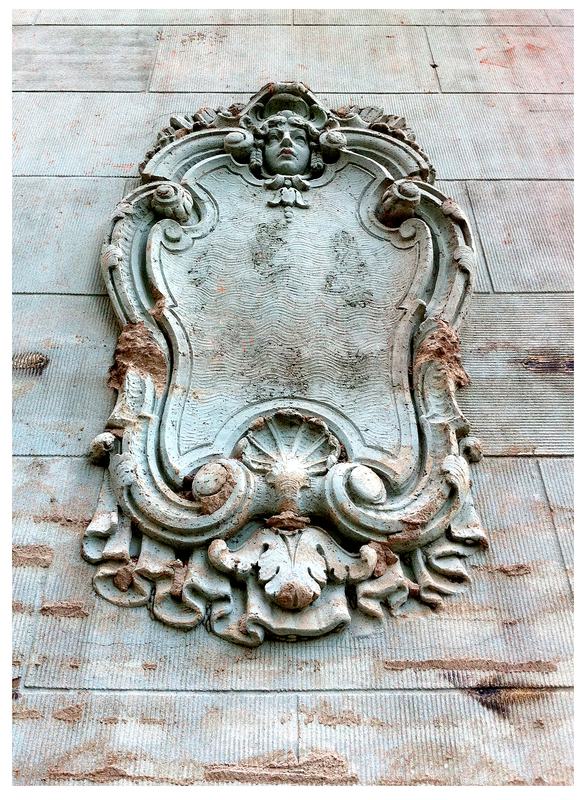 Most of all, I’m delighted that the ponderous face atop this cartouche will be able to look out on nearby White Park — and the future — with an unobstructed view of both. Riverside’s Old Historic Foundation blog has more pictures and information on this building. To learn more about it, and other saved and imperiled buildings, click here. Wow. Keep an eye on this, I’ll be hoping to see what they do to it through your lens! I’ll report back, for sure … I really am interested in how it will all work out! Isn’t it a joy to find these treasures? As you said we’ve lost so many of our historic buildings and to know that this one will be revived to a useful purpose is great. I just hope that they do it justice. I’m sure that we will have lots of folks watching with us. I’m so happy it’s been saved, too! I wonder whether they’ll make an attempt to recreate the sheared off bits; that would be really interesting to watch happen. There has to be some of the masters at this sort of work left, or at least someone who knows the right way to repair those bits. I know that I’ve got some ideas but I’m sure that I’m nowhere close. It would be a fun thing to do to watch and learn how to repair such bits. One of my favorite things to do. Agreed … I’m wondering if the original molds still exist somewhere … though I think it would be interesting to see the rough, sheared-off bits used as-is in the whatever the new scheme is. 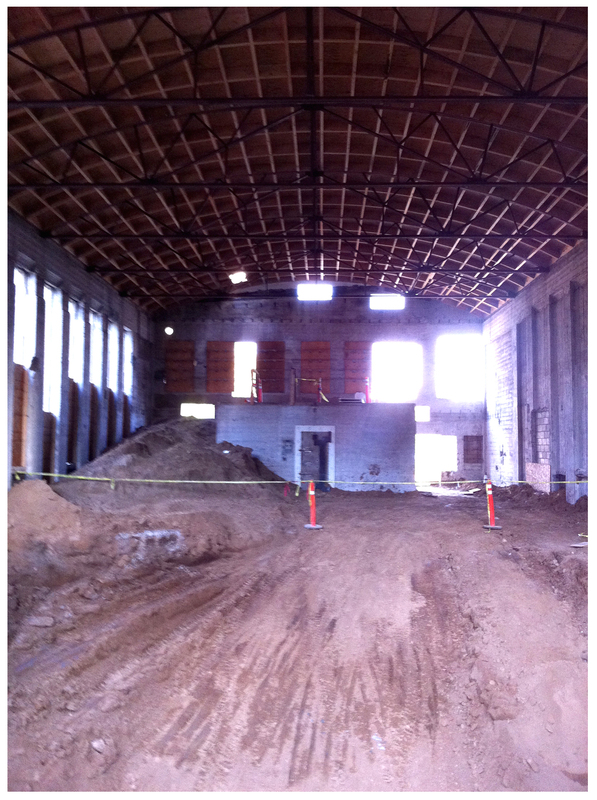 I’m so excited about this building’s preservation … and can’t wait to see the finished synthesis of new with old. It’s so beautiful, and so very 20’s California. What a joy to hear it is being saved! You made my day! So, scraping my back on the security fence was worth it!